Discover the future of lighting with Enbrighten Vintage Seasons Cafe Lights. Choose vibrant colors for any occasion or holiday, celebrate your favorite sports teams or choose warm vintage white for beautiful year-round installations with a premium design. You never have to take down your outdoor holiday lights again. These carefully crafted Edison-style cafe lights boast the functionality and durability of the standard LED model with a stylish, vintage twist plus selectable color modes. The impact resistant bulbs exude a soft, amber glow, creating an instantly warm atmosphere to any location or choose your favorite color, two-color combination or a variety of preset color modes. 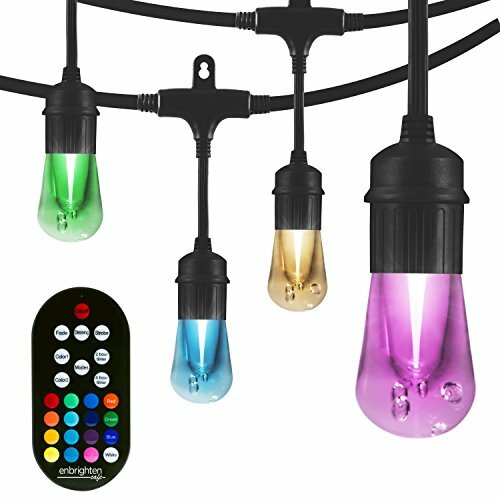 Enbrighten Vintage Seasons Cafe LED Lights by Jasco include 12 bulbs on a 24-ft. string and are linkable up to 750 ft. , so you will be sure to have as much light as needed to illuminate any space. Experience endless possibilities with Enbrighten Cafe LED Lights by Jasco, lighting for life. Comes with remote to select color, with included and 2 or 4 hour timeout options. The product is UL listed and backed by a limited-lifetime LED .